HALF MOON ISLAND, Antarctica -- Iceberg Alley is an aptly named narrow channel on the western side of the Antarctic Peninsula. The water is afloat with glassy splinters, hardly bigger than an ice cube, ranging up to colossal tabular icebergs, some the size of several football pitches. Cruising down this channel in subzero temperatures, it's difficult to imagine Antarctica may be suffering from the effects of global warming. But these giant breakaway icebergs may in fact be signaling the continent's meltdown. Icebergs originate from ice sheets, which form on land from millions of years of snowfall. As the ice gravitates towards the sea, it naturally breaks up. But scientists say the ice around the Antarctic Peninsula is disintegrating at unprecedented rates and blame warmer weather. In the last 50 years, this region has experienced a 2.5C increase in average temperature. That is a faster rise than any other place in the southern hemisphere. Walking along the pebble beach at Half Moon Island, Chris Edwards, a geologist from Scotland, says the changes are obvious. "I am horrified by the amount of red snow algae I am seeing now, which means we're down to 'old snow.'" Edwards suggests that's a tell-tale sign of a serious change in weather patterns. "Evidence like this is everywhere. For example, the Northeast Glacier used to be buffered on to Stonington Island. It's retreated 40 meters (45 yards) in the last 35 years. Now, there's no ice ramp attaching it to the mainland." This month is the launch of International Polar Year (IPY) -- an ambitious scientific effort involving over 200 projects -- which will study exactly these types of geological changes. Researchers will investigate reductions in ice sheets and explore the impact on sea levels and marine ecosystems. Birgit Sattler, a microbiologist from the University of Innsbruck, Austria, highlights the need to raise awareness of these issues. She is conducting a month-long scientific project into glaciers around Port Lockroy, a former whaling station which is now a British research center. 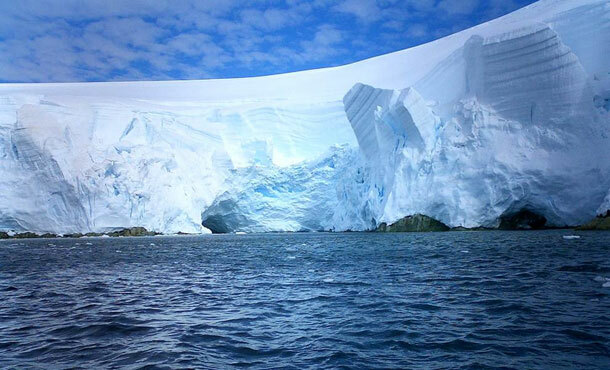 "The Antarctic ecosystem is very sensitive and tiny climate changes have dramatic effects. There are far longer vegetation phases now. Plants are growing at much higher altitudes. It's really important to tell people about this." Before the research papers of the IPY's scientists are published, for those living on the southern polar cap, climate change is already palpable. Rick Atkinson is Base Manager at Port Lockroy. He has been working in Antarctica for more than 20 years. "We have to recognize what is happening here. When it's meant to snow, it starts raining. That's not normal."